Thanksgiving is a special holiday that brings together family and friends, but it also can carry some hazards for pets. Holiday food needs to be kept away from pets, and pet owners who travel need to either transport their pets safely, find safe accommodations for them at home or board the pets. Follow these tips to keep your pets healthy and safe during the holiday. Quick action can save lives. If you believe your pet has been poisoned or eaten something it shouldn’t have, call your local Animal Emergency Clinic. You may also want to call the ASPCA Poison Control Hotline: 888-426-4435. Signs of pet distress include: sudden changes in behavior, depression, pain, vomiting, or diarrhea. Contact your veterinarian immediately. Visitors can upset your pets. Some pets are shy or excitable around new people or in crowds, and Thanksgiving often means many visitors at once and higher-than-usual noise and activity levels. If you know your dog or cat is nervous when people visit your home, put him/her in another room or a crate with a favorite toy. This will reduce the emotional stress on your pet and protect your guests from possible injury. If your pet is particularly upset by house guests, talk to Dr. Anderson about stress and anxiety aids before the holiday. Learn about dog bite prevention. Identification tags and microchips reunite families. Make sure your pet has proper identification with your current contact information – particularly a microchip with up-to-date, registered information. That way, if they do sneak out, they’re more likely to be returned to you. If your pet isn’t already microchipped, talk to a technician at Companion Animal Hospital about the benefits of this simple procedure. Your pet needs a health certificate if you’re traveling across state lines or international borders, whether by air or car. Learn the requirements for any states you will visit or pass through. Learn more about health certificates. Learn more about properly restraining pets in vehicles. Don’t forget to protect your family and loved ones from food borne illnesses while cooking your Thanksgiving meal. Hand washing, and safe food handling and preparation, are important to make sure your holiday is a happy one. The U.S. Department of Agriculture offers tips for handling, thawing and cooking turkey, as well as saving your leftovers. Companion Animal Hospital will closed for all business and appointments on Thursday November 22nd and Friday November 23rd. The office will open at 7:30am on Saturday November 24th and will close at 12pm. 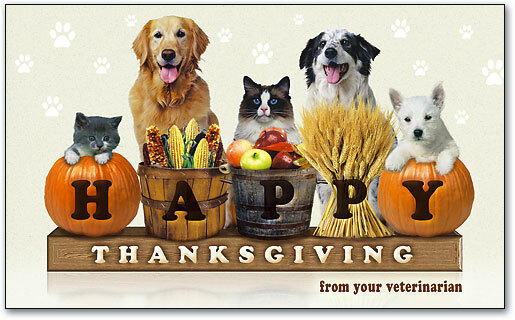 Dr. Anderson and her staff wish you a safe and happy Thanksgiving holiday.